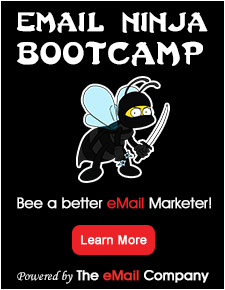 Do you want more results from your email marketing campaigns? Chances are, your answer is yes. I mean, who doesn’t want more audience, clicks, and conversions? 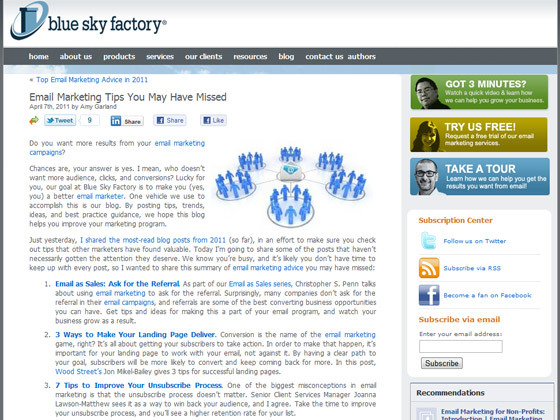 Lucky for you, our goal at Blue Sky Factory is to make you (yes, you) a better email marketer. One vehicle we use to accomplish this is our blog. By posting tips, trends, ideas, and best practice guidance, we hope this blog helps you improve your marketing program. Email as Sales: Ask for the Referral. As part of our Email as Sales series, Christopher S. Penn talks about using email marketing to ask for the referral. Surprisingly, many companies don’t ask for the referral in their email campaigns, and referrals are some of the best converting business opportunities you can have. Get tips and ideas for making this a part of your email program, and watch your business grow as a result. 3 Ways to Make Your Landing Page Deliver. Conversion is the name of the email marketing game, right? It’s all about getting your subscribers to take action. In order to make that happen, it’s important for your landing page to work with your email, not against it. By having a clear path to your goal, subscribers will be more likely to convert and keep coming back for more. In this post, Wood Street’s Jon Mikel-Bailey gives 3 tips for successful landing pages. 7 Tips to Improve Your Unsubscribe Process. One of the biggest misconceptions in email marketing is that the unsubscribe process doesn’t matter. Senior Client Services Manager Joanna Lawson-Matthew sees it as a way to win back your audience, and I agree. Take the time to improve your unsubscribe process, and you’ll see a higher retention rate for your list.